Growing up an only child, cousins were my main source of entertainment throughout childhood. For the first 11 years of my life, I had only 2 cousins that I knew, and they lived up north in Washington – a good 2 hour drive. I remember seeing these older, and therefore automatically cooler, cousins on special occasions and always taking advantage of the short amount of time to study them and try to figure out how to be as cool as they were. The younger one, Kaisa, was my idol and I wanted to be just like her – so pretty and funny and free-spirited. I remember one trip up there while my mom was in Mexico, I got to spend a week with Kaisa, completely glomming onto her and becoming her mini-me. This meant that when she got corn-row braids in her hair, I just had to get them too; and obviously I blasted all of her favorite music and ate the same things she did. Here’s a throwback of us, during that amazing summer I spent in Olympia. 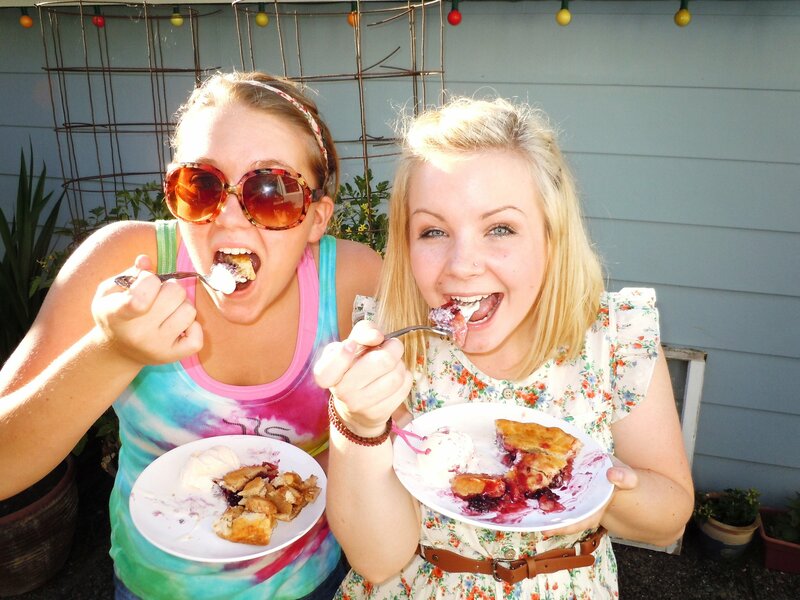 We’re stuffing our faces with the incredible pie we invented: Blackberry and Apple. It was huge hit, so when I made it for Bobby’s family this last summer, I wasn’t surprised when one of my new cousins ran off with the whole thing! I never stopped looking up to this wonderful lady, she was and still is the closest thing I have to an older sister. Kaisa is the most creative person I know, and neither of us have given up our imaginations. Only instead of building forts and making friendship bracelets into the wee hours of the night, we are cooking, baking, photographing and doing neat things. She is also a blogger – LavenderandFir.com is the blog where her and her equally as creative husband, Jordan, post amazing recipes and gardening and DIY tips. Which brings me to this egg souffle recipe! Kaisa and Jordan are urban farmers. They plant an enormous garden in their backyard every year, filled to the brim with tons of fruits and veggies. There’s also a chicken coop in their backyard, with 7 laying hens inside that lay fresh eggs daily. These eggs are my favorite part! Fresh eggs make for the tastiest breakfast, perfect for brunch on a lazy sunday. These souffles taste great served with has browns and garnished with avocado. Start by pre-heating your oven to 350* and browning the sausage. Reserve some of the grease in the skillet. Next, chop up the onion and mushroom, then place the mix into the skillet to sauté while you chop the tomato, cilantro and basil. In a medium bowl, whisk the eggs, cream and flour until well combined. Stir in the sautéed onions, mushrooms, half of the basil, a pinch of pepper, a sprinkle of salt and a dash of hot sauce. Whisk these all together really well. Pour mixture into greased single serving bakeware, filling to about 3/4 of the way up. Put equal portions chopped sausage in each and then sprinkle some additional grated cheese on top. Place dishes onto baking sheet and put into oven. Bake until fluffy and golden brown (about 25-30 minutes). While your souffles bake, prepare the hollandaise sauce according to directions on back of packet. When done baking, remove the souffles and top with warm hollandaise sauce, freshly chopped tomatoes, cilantro, and pepper. Wah-lah! A beautiful sunday brunch in less than an hour.